Perhaps the most tantalising cinematic fare on offer in recent memory, Magic Mike XXL (2015) hit cinemas like a well-oiled, lust-filled missile. Voraciously gobbled up by keen viewers, this sequel is decidedly a step up from the first installment. Free from the sombre Soderbergh lens, director Gregory Jacobs and writer Reid Carolin give us the more free-spirited, good-natured and still charming as all hell Kings of Tampa, with Mike Lane (Channing Tatum) at the helm. It’s frothy, camp and pitched perfectly. Three years on from 2012’s Magic Mike, Mike is having a hearty go at normal life: out of the spotlight, he’s now building his own furniture business. After getting a woebegone call from fellow male entertainer, Tarzan (Kevin Nash), he is lured back into the Kings circle. Clumsy back story for each of the chaps is shared poolside but Mike is offered the opportunity to take “one last ride” for a stripper convention. The ever-virile Richie (Joe Manganiello) proposes nothing but good times and plenty of scandalous action for the boys. What ensues is a sequence of chuckle-worthy, saucy moments: the boys vogueing for cash in a gay bar, taking drugs and dancing at gas stations, schmoozing with simpering Southern housewives and, in grand fashion, taking a stripper convention by storm. There’s no grand dramatic thrust, there are no fatal twists of fate. Rather, Magic Mike XXL thrives on a series of interludes. It’s all chummy chat and seriously suggestive dance routines but that is all-encompassing charm of the film. Each of the boys gets their moment in the sun and it finally feels like audiences can cosy up properly. Some of the best moments are Richie’s. He positively steals the first act with his rather titillating and smile-inducing roadside dancing routine to the Backstreet Boys anthem I Want It That Way. Ken (Matt Bomer) comes a close-second as the New Age babe, crooning and boyishly spewing good karma as a saunters through scenes. The new additions are more of a mixed bag. Jada Pinkett-Smith as Roman, the Atlanta emcee with so much sultry sass it’s catching, is an excellent bit of casting. Amber Heard and Donald Glover, on the other hand, seem to serve as pointless, dull secondaries that never seem to make an inviting impression. Arguably another disappointment is that, at a little more than two hours, this is one film that could benefit with edits, in spite of its hefty subject matter. 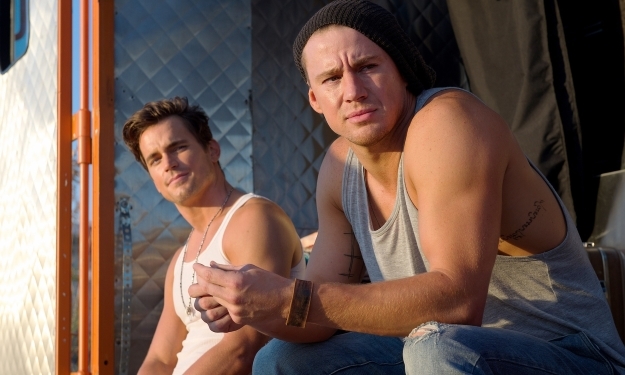 Magic Mike XXL is pure fun, plain and simple. A buddy road film for the ages, there’s enough sexual innuendo to tide you over until next year, enough nervous giggles elicited to keep your mind wandering and plenty of good feelings that leave you wanting more.